Worship Ministries desires that every worshiping community in the CRCNA experience Spirit-filled gospel proclamation and worship that is directed to God, is biblically based and theologically Reformed, and is characterized by creativity, discernment, spiritual vitality, the faith formation of all worshipers, and a call to serve others. Worship Ministries desires that every worshiping community in the CRCNA experience Spirit-filled gospel proclamation and worship that is directed to God, is biblically based and theologically Reformed, and is characterized by creativity, discernment, spiritual vitality, the faith formation of all worshipers, and a call to serve others. 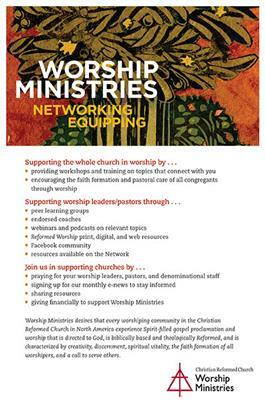 We do that by creating opportunities for worship planners, leaders, and pastors to form supporting networks, equipping them through the nurturing of those relationships, the creation of free webinars and resources, the formation of online communities, and the publication of the Reformed Worship journal.